To promote my blog Mission Improvable, an exploration of themes, shows, thoughts and experiences related to improvisational comedy, I posted on a variety of social media platforms to encourage friends and followers to read and talk about my posts. I was initially hesitant to publicize my blog until I was fully satisfied that the content was objective and removed from any judgment of my personal friends and co-improvisers. Many people in my improv troupe in years past had fallen victim to the temptation to create cyber-drama with their blogs. What started as a means to explore and discuss the craft had become more vindictive and counterproductive than anything else. Once I had a few friends read through it, however, I posted publicly was on my Facebook to tell all my personal friends about it. I also posted the link on my Twitter account to tell some of my followers, many of who are not my personal Facebook friends. In addition to Facebook and Twitter, I posted a link to my blog on my Tumblr account. One of the great aspects of Tumblr is that you can tag posts for oft-searched phrases. The picture above doesn’t show it, but I tagged the post for “comedy,” “improv,” “blog” so anyone who searches those terms would find the link I posted. 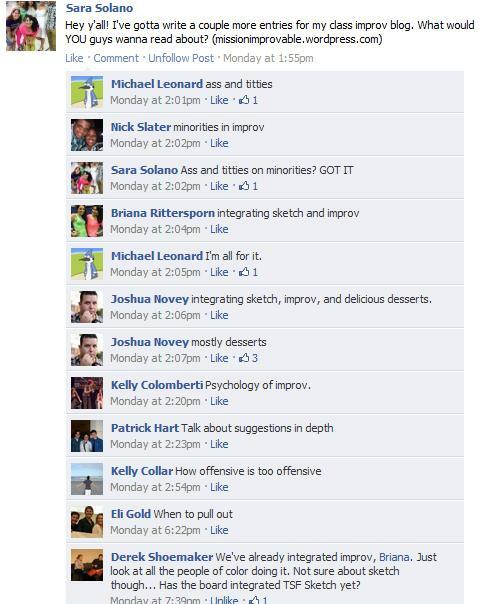 I also had the idea to post in Theatre Strike Force’s community group on Facebook to gather suggestions for what they as improvisers and as a general blog audience would want to read about. Among the plentiful off-color jokes (they really can’t help themselves), a few members had some great ideas that I wound up writing about. I thought this was a great way to raise awareness about the blog and that incorporating their ideas would encourage them to read it as well. 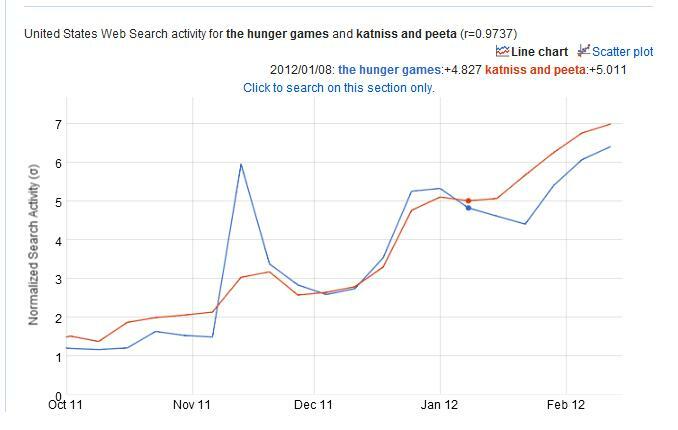 On April 7 when I initially posted about the blog, my views spiked to about 28 that day alone. While most other days had only a few views, I had seven when I posted the first article that I took as a suggestion from the TSF Facebook thread and had spikes up to 19 views on days I posted new content. Overall, my social media efforts definitely helped in garnering page views and user interest, but there’s still a long way to go to get any kind of regular readership. President Obama’s first speech in 2010 focused on a broad spectrum of topics, including energy and family issues. 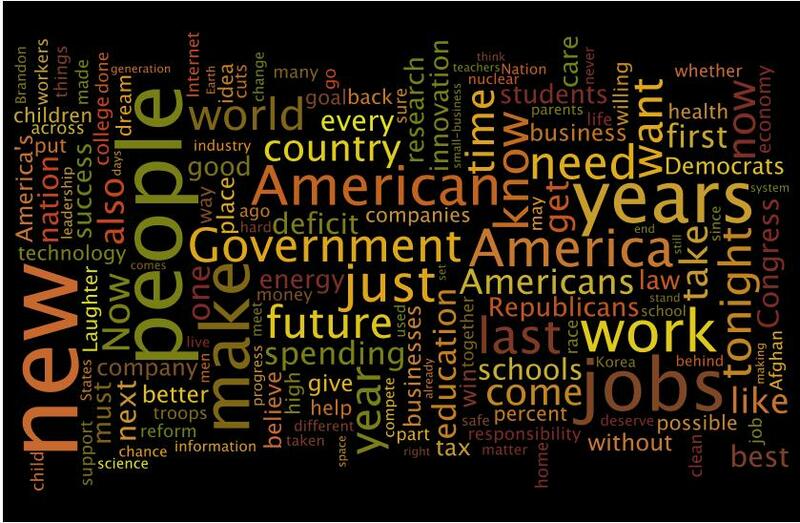 Using America and Americans as buzzwords effectively related the topics of the speech to the people he was addressing. 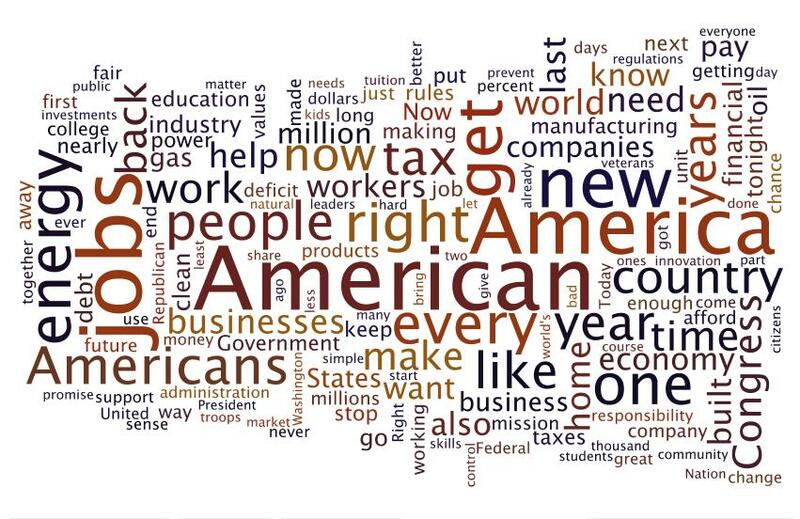 In 2011, the primary subject in his speech involved business and the economy as a whole, as well as multiple comparison words like “last.” By 2012, Obama has been focusing on creating jobs for Americans and the continuing state of the economy. “Jobs” is one of the most prominent words over the three years, and it highlights the state of the economy and Obama’s priority to improving the job market. One of the great things about this tool (and the concept of word clouds in general) is that it clearly shows users words that are the central ideas behind an article. Therefore, a writer can use it both to analyze overall themes and possibly prevent overusing a particular word in their own work. Wordle makes it nearly effortless for a user to pick out the core ideas of either one piece itself or to compare multiple articles and essays on a particular topic. It can even be used to show who will be a prominent presence at a conference! Journalism’s evolution as a business has progressed just as much as another form of social media. The presentation of the news is just as important as the news itself to readers, and a journalist’s ability to understand and incorporate this new idea is the core of his or her success. BBC business editor Robert Peston spoke about the future of journalism and the idea of the total journalist. The total journalist does not specialize in television broadcast or print, but is versatile enough to contribute to any medium their readers may desire. Newspapers’ competitors are not limited to other papers, but also morning news shows and citizen journalist-fueled blogs. Peston’s blog, Peston’s Picks, is the central nervous system of his work, but it also connects all the other aspects of his contribution to the media. Just as the beginning of broadcast journalism involved the rote reading of wire copy on-air, online media is still bumbling around like a newborn giraffe. However, each passing year gives us a more definitive idea of how to best utilize all this technology to reach the broadest audience possible through both good quality in-house content and the integration of outside resources. Stimulating readers to find news just as interesting as browsing Facebook has proven to be a difficult task, but understanding how to personalize the news can prove to be just as worth reading as the Facebook status from that girl you met at freshman orientation you haven’t spoken to since that one time you saw her in the dining hall and you had nothing to talk about. Although many news organizations have come to embrace social media with gusto, an antiquated ideology can control the legal guidelines that hinder journalists working for an organization and not on their own. Mathew Ingram mentions how E.W. Scripps’ policies intended to separate a journalists’ personal and professional lives. However, conflicting wording and a somewhat misinformed understanding of the function of social media in terms of interaction with a readership stunts their development with this new frontier. The New York Times has incorporated personal interaction with readers to integrate their ideas in their reporting and fostering conversation based on users’ suggestions. Brian Stelter has become an institution who can be counted on for a great personal take on things that users look for. This kind of relationship can only be possible by organizations opening their minds to carefully blend personal and professional — with limitations, yes, but also with the understanding that their own audience is their most valuable resource. Journalists have had less of a responsibility in telling people the news and more about engaging an audience to influence, shape and weight in on the news and how it affects them. This idea of fostering open conversation has permeated into the established journalistic culture, and there is now even a Pulitzer for real-time reporting. Curation and collaboration are now on the forefront as a priority for journalists and their corporate developmental counterparts. As I’ve mentioned before, the crowdsourcing capabilities of social media has made journalists nearly unstoppable in terms of making them more powerful than simply one man or woman working alone. Trend stories are all the more accessible, and we now have the ability to connect and share stories and information with a wide array of sources from across the globe. Tools like Google Trends and Google Correlate shows how much and where topics are being discussed and their relationships with other happenings in the news. This provides journalists with an even deeper analysis rooted in concrete statistics. Better yet, a younger generation can engage with the world around them with ease without running the risk of being “uncool” by picking up their parents’ daily paper. Posting links on Facebook is the hip new thing, and keeping up with the latest news has been made painless through the Twitter timeline. Curious about how to maintain must-read content? Check out these articles compiled by Nieman Reports here. The Broward Bulldog is the epitome of new-age media. A not-for-profit, independent online-only website, it focuses on investigative, watchdog journalism in Broward County, Fla. It all got started when Christensen was laid off by the Miami Herald in the late spring of 2009. He wanted to continue to report and didn’t want to move anywhere else. He had been a reporter in South Florida for roughly 30 years and didn’t want to stop. That’s how Florida’s first not-for-profit news site, which is staffed by professional journalists, made it online in October 2009. The Bulldog focuses on doing stories that the main newspapers of the area (mainly the Sun-Sentinel and the Miami Herald) haven’t done, Christensen said. Just like any startup business, the greatest challenge Christensen faced was making his project work financially – and he still hasn’t quite figured it out. “We get money from several different sources, but we’re not rolling in it,” Christensen said. The Bulldog has a business plan, but it’s only been able to implement it partially. Christensen used his own money to pay for the start-up costs, and has since relied on donations, fundraisers, selling stories and ad revenue to pay his staff. Crime writer Michael Connelly, author of the novel “The Lincoln Lawyer,” has given the most substantial donations to date, but the Bulldog has not been able to rely on individual grants alone. Ad revenue is something that Christensen hopes to increase, however, because most of the ads that can be seen on the website are Google ads that don’t make much of a profit. The Bulldog still hasn’t been able to hire an ads salesman. While the Bulldog figures out its finances, editing positions are voluntary. It pays reporters a small amount for each article and hopes to increase this amount to make the project viable for all who participate. “If people weren’t volunteering, [the Bulldog] wouldn’t exist,” Christensen said. Aside from being editor-in-chief, Christensen posts all of the stories to the Web, writes headlines, manages social media and also has to deal with the business side of the project – stuff he would never have to worry about if he was at a newspaper. With a small staff of about nine, five of those are reporters, but the number is constantly fluctuating. Every story gets edited at least twice by the experienced editors Christensen has on board. On average, the Bulldog posts two to three stories a week, a significant increase from last year. Like any online news website, the Bulldog is using social media to share its stories and alert followers when it’s added something new. It offers a variety of ways to connect through social media, including RSS, Digg, Twitter and Facebook links that are prominently displayed in the upper right corner of the webpage. However, any visitor can see that social media are not the Bulldog’s first priority. Digg, a site that is “a place for people to discover and share content from anywhere on the web,” has not seen an update from the Bulldog since Jan. 6. The Bulldog’s Twitter site is updated periodically, with some days featuring several links to stories followed by no tweets until several days later, when a single story link is tweeted. The site’s Facebook page is regularly updated with stories, though several days can pass before anything new is added. Despite the irregularity in updates, about 600 people on Twitter and 700 Facebook profiles follow the Bulldog. Christensen said social media play a significant part of the promotion of the Bulldog and are a way to tell people there is something going on. The Bulldog hopes to eventually be able to hire someone to manage the site’s social media and improve its search engine optimization, or SEO. The website is organized to include a front page featuring the latest stories from the staff, a Bulldog Extra section for featured articles not written for the Bulldog or by its reporters or freelancers. A separate section features a blogroll with links to multiple regional independent news sites like BrowardBeat.com and public records resources. Instead of repackaging press releases into articles, the Bulldog has a section on its site dedicated to posting releases. The news site has been featured in and attributed by publications from around the country, including Quill Magazine, Investigative News Network, The Brechner Report, New York Daily News, The Miami Herald and the South Florida Business Journal. Christensen hopes to establish the Bulldog as a working news organization in Broward County, becoming a permanent source of news for the community. Although sometimes progress can be frustratingly slow, the community is responding and numbers have been increasing, he said. In terms of traffic, the Bulldog had about 9,000 to 10,000 unique hits per month last year. In February of this year, it hit about 20,000. In March, it hit about 25,000. Ultimately, the goal of the Bulldog is sustainability, or being able to have a better income. Christensen said he’d like for the Bulldog to have an actual staff where people get a salary, including benefits. While he’s not sure when this will be possible, the Bulldog is working toward it all the time and hopes to create jobs for journalists in South Florida. Facebook has one of the greatest appeals of all social media platforms by offering opportunities to connect with both personal friends and “fans” as two separate entities. For prominent figures or news organizations, interacting with an audience as an organization is just as simple as an individual reporter conducting research and talking with sources on a more personal level. The news feed serves as a mini bulletin board for updates and developments on all sorts of subjects. Mine alone as a news-savvy college student is peppered with posts from Buzzfeed, The Huffington Post and Gawker daily, as well as important breaking news on a national and international scale. You remember the flood of updates about Osama Bin Laden’s death and “RIP JoePa” statuses. Facebook has also played just as much of a role as Twitter, Tumblr and LinkedIn toward building a reporter’s or news outlet’s brand through pages. Even more ways to curate news, such as allowing a separate section of a user’s profile to be dedicated to posting articles (as opposed to grouping all links together as a kind of post), would be greatly beneficial to journalist’s searching for news and leads. Of course, with a more personal connection comes deeper ethical hot water for journalists. My ethics class has wrestled with the idea of what is considered appropriate in terms of reporters “friending” sources as business associates like a city mayor or police public information officer to avoid blurring the line between a social and professional connection. The term “friend” on Facebook has come to mean so much more than a buddy you get coffee with, but rather has come to signify any kind of connection. However, the less opportunity to give the impression of bias, the better. This decision in the end, though, is the prerogative of the journalist. 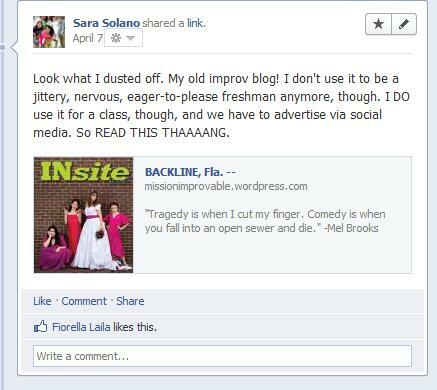 So far, I have only reached out to certain friends on Facebook about my topic blog because blogging about improv has become such a sensitive topic recently in the comedy scene (some have published controversial posts that have ticked off a number of fellow improvisers). However, reception to the blog has been great, so I’ll likely expand my promotion of it to posting links to individual articles both on my own profile and in comedy groups I’m a member of. Radical changes in the media landscape and how news organizations are dealing with these changes has resulted in many turning to the idea of a complete overhaul of the current system. In response to an essay by Dean Starkman called “Confidence Game,” NYU professor Clay Shirky asserted that the experiments of today are paving the way for systems to be in place for later developments about how news outlets are organized. The best way news organizations can cope with the dynamism of their own industry is to embrace the ideals of these changes. Digital means quick, and daily newspapers that have become accustomed to filtering news through an entire workday must adapt to meet the expectations of an evolving audience. Institutions like The New York Times could not have survived today by resting on their laurels; they have fluidly accepted the shifting landscape. Outlets must be constantly aware (“constant vigilance” for all you Harry Potter fans) and thinking — an idle mind is the lazy journalist’s workshop. Instead of succumbing to “inevitable” changes, media should consider all the possibilities of how to incorporate the new ideals of the public to best suit their own organization. I Googled "constant vigilance" and this is what came up. Even in college, new age media has been rivaling long-standing local print media institutions. Small news teams relying on outside help through crowdsourcing are able to cover a wide array of subjects and events through a dedicated, engaged readership that the larger staffs who are still spread so thin on a daily basis are struggling to keep up. Journalism students now are encouraged to not only blog and use all sorts of online media, but to blog about and explore this new technology as well. What really needs tweaking is how two viewpoints like Starkman’s and Shirky’s hold completely reasonable amounts of water. Starkman’s plea to reinvent old organizations instead of forming new ones can be combined with the approach bloggers have taken to overtake Old Reliables. What the media industry needs is a steady balance of both reinventing old favorites and embracing the fresh approach of online outlets generally run by a digitally-savvy younger generation.